The Bich Poo (also known as a ‘Poochon’ or ‘Bichpoo’) is a cross between a Poodle and a Bichon Frise, a mix which likely originated in the United States. Poodle crossbreeds are meant to produce a dog with mixed traits and the Poodle’s signature nonshedding coat. As a crossbreed, the Bich Poo is not eligible for registration with purebred registries such as the American Kennel Club, but it can be registered with the American Canine Hybrid Club, as ‘Poochon’. The Bich Poo is not considered a purebred because it doesn’t ‘breed true’, meaning that it doesn’t display a consistent set of characteristics. Like other ‘designer breeds’, the Bich Poo has seen a recent surge in popularity. Some breeders produce Bich Poos by crossing a purebred Poodle with a purebred Bichon Frise (called a first generation cross), but others allow crossing Bich Poos with Poodles or Bichon Frises (called a backcross), or other Bich Poos (called a multi-generation cross). Different crosses can result in different characteristics. The Bich Poo varies in size and appearance, depending on its parents and whether it is bred from a Standard, Miniature, or Toy Poodle. On average, Bich Poos weigh 6-15 lbs (3-7 kg). The Bich Poo has a soft, curly coat. Most Bich Poos have little dander and do not shed, making them a good match for those with allergies. Owing to its Poodle heritage, the Bich Poo comes in a wide variety of solid or mixed colors. White and apricot are most common; other colors include gray, black, and chocolate. 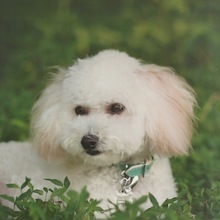 The Poochon may be groomed like a Poodle or with a fluffy Bichon style, or given a shorter, low maintenance ‘puppy cut’. The Bich Poo is sensitive, responsive, and affectionate. Bich Poos love to play and have a seemingly endless supply of energy, though they are not as hyper as some breeds and are happy to curl up on the couch for a nap. On the other hand, Bich Poos may have sudden spikes of energy which cause them to run wildly around the house, like the Bichon Frise. The Bich Poo is very intelligent and clever; it has a habit of entertaining its owner with clever tricks. Bich Poos make good watchdogs. The Bich Poo is sensitive, responsive, and affectionate. Bich Poos love to play and have a seemingly endless supply of energy, though they are not as hyper as some breeds and are happy to curl up on the couch for a nap. On the other hand, Bich Poos may have sudden spikes of energy which cause them to run wildly around the house, like the Bichon Frise. The Bich Poo is very intelligent and clever; it has a habit of entertaining its owner with clever tricks. Bich Poos make good watchdogs. The Bich Poo is friendly toward strangers, children and other dogs. Bich Poos are great companions for kids, but should be supervised around young children to prevent them from teasing the dog or playing rough. Since the Poochon is a hybrid, it may exhibit characteristics of both the Bichon Frise and the Poodle. You can find Bich Poo puppies priced from $250 USD to $3400 USD with one of our credible breeders. Browse through our breeder's listings and find your perfect puppy at the perfect price. The Bich Poo is friendly toward strangers, children and other dogs. Bich Poos are great companions for kids, but should be supervised around young children to prevent them from teasing the dog or playing rough. Since the Poochon is a hybrid, it may exhibit characteristics of both the Bichon Frise and the Poodle. The Bich Poo must be brushed regularly and groomed every two to four months, depending on grooming style. Bathe only as necessary. The Bich Poo has a lifespan of 12-15 years. The Bich Poo may be susceptible to health problems affecting the parent breeds, such as allergies and eye cataracts, but as a mixed breed it is somewhat less likely to suffer health problems than purebreds (known as ‘hybrid vigor’). The Bich Poo is intelligent and therefore easily trained. The Bich Poo can learn a variety of tricks and behaviors very quickly. The Bich Poo enjoys working with its owner and requires a consistent training approach. The Bich Poo is an active dog requiring daily exercise such as a walk, playtime in a fenced-in yard, or a visit to the local dog park, though it can meet a lot of its exercise requirements through indoor play. Most Bich Poos enjoy swimming. Bich Poos are great dogs for an apartment or condo. Bich Poo Puppies for Sale - Shipped Worldwide! Finding the right Bich Poo puppy can be dog gone hard work. PuppyFind® provides a convenient and efficient means of selecting and purchasing the perfect Bich Poo puppy (or Bich Poo puppies) from the comfort of your home, 24 hours a day, 7 days a week. Take advantage of our PuppySearch or leisurely browse our directory of hundreds of dog breeds, Bich Poo dog breeders, Bich Poo dogs for adoption, and Bich Poo puppy for sale listings with photos and detailed descriptions. Some Bich Poo puppies for sale may be shipped Worldwide and include crate and veterinarian checkup. Many Bich Poo dog breeders with puppies for sale also offer a health guarantee. With thousands of Bich Poo puppies for sale and hundreds of Bich Poo dog breeders, you're sure to find the perfect Bich Poo puppy.